Walking in the sunshine, exploring the landscape and its history and scavenging materials and ideas along the way we had a constructive time combining story-making and science! The day started at the Hengistbury Head Visitor Centre, talking with volunteers and exploring the garden and exhibits.We learned about the land use and people who lived on Hengistbury Head 12,000 years ago and how they used naturally occurring materials such as flint to create weapons and tools. Martin led the group over the top to the triangulation point and introduced us to the smell of gorse flowers.... try them - you'll be so surprised they smell of coconut! Even more surprising Bill informed us that you can eat the closed flowers. We scavenged for ideas along the harbour shoreline, collecting wood, string and other interesting objects for raft and art making before heading over to the beach side for more of the same. 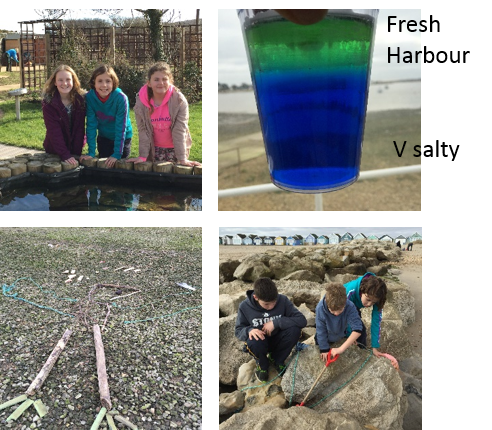 We took the ferry back to Mudeford Quay and spent some time creating characters for stories, creating beach art and making a raft before getting stuck into science experiments looking at how salty the harbour is compared to freshwater and brine solution we made up. We experienced for real how the water level changes as the tide comes in and consumed our Mudeford Monster and Dragon. We're really looking forward to the Super tide on 22 February! "Tides come in at different times"
"There's a hill [over there] with an important person buried in there"
"How easy it is to make creatures on the beach"